GPO are the largest member of the cephalopod family with the largest weighing 156 lbs. GPO have eight arms with two rows of suckers on each arm for adhering to rocks and to prey. GPO have two glands – one with saliva that can be sprayed to help open prey and one with toxins or “ink” to help ward off predators. They can also spray for jet propulsion. GPO mostly use their arms as legs to crawl slowly along the ocean floor. The “spray” can produce a burst of speed but only for a short distance. An octopus can compress it’s entire body to fit into a space as small as it’s beak which is the only hard part of their anatomy. A GPO can alter it’s colour and the texture of it’s skin to create amazing camouflage. GPO are cool blooded , have three hearts and have blue blood! Seals, sea otters and some whales will eat octopus. The octopus eats fish, muscles, barnacles, crab and clams. GPO live from 3-5 years in the wild. The female can lay up to 400,000 eggs. Not all of these survive of course but the female looks after the eggs blowing water over them to keep things from growing on them. Octopus are known to be very intelligent. They can complete simple puzzles, unlock simple cage mechanisms and recognize humans they come into frequent contact with. 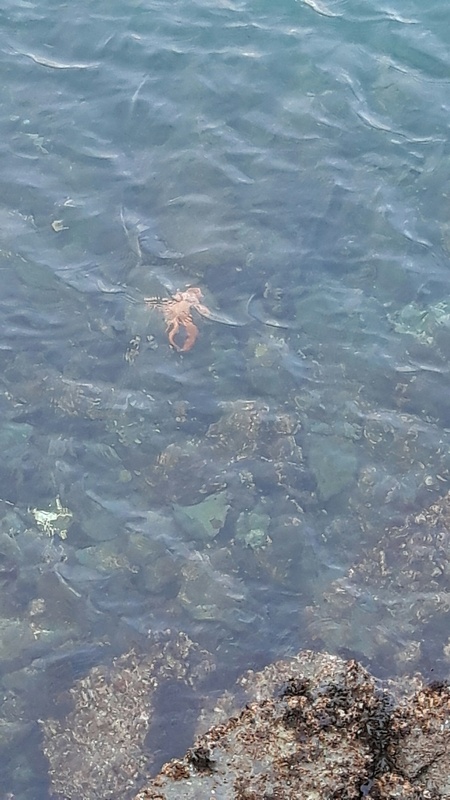 This photo of a Giant Pacific Octopus was taken off of the pier at Ogden Point in Victoria BC.